Two Hours | carpe diem! Can you see the difference? I can’t either. 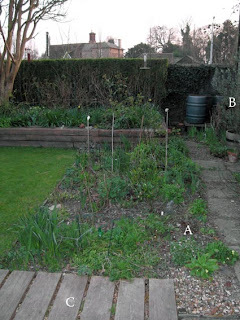 Except for ‘A’ which is where I removed the giant dandelion that’s been mocking me all winter. ‘B’ is an olive tree that’s survived outside for the last 10 years. Just barely; it would help if I remembered to water it occasionally. Even an olive tree needs some water when planted in a tub. ‘C’ is the path to our door, which is beautiful in an architectural way but extraordinarily ugly if viewed as a functional item. Something Will Be Done about this soon. I was going to ply this lot tomorrow, but Alden Amos says it’s best to wind newly spun singles onto another bobbin before plying, so I’ll do a shuffle of yarn on bobbins tomorrow and then find out what it looks like plied. I’m fairly sure I’ll dislike the stripiness, although I have thought of a yarn I should be able to make with these colours that could make socks. Even if BFL socks won’t last very long! But I may have found a home for yarn I make that’s of decent quality even if I hate the colours: a local Freecycler has just asked for yarn and any tools used in fibre arts. I’ve asked for more details. 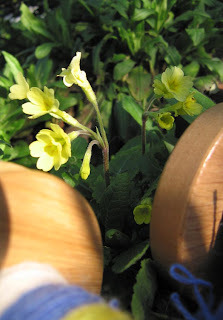 Nestled behind the bobbins is one of my cherished ‘hose in hose’ double primroses. These are reputedly Elizabethan in origin, hence the name. They’re not entirely happy in this garden; I usually manage to keep three or four plants by dint of frequent, careful division and replanting. Meanwhile the common ‘wild’ primrose is marching along the borders smothering all before it in a mass of pale yellow flowers. Another two hours today and you can see a difference in the garden: two inches of bark mulch covering the remains of my battles with the weeds. Oh, and my left knee is twingeing unhappily. Never mind, if I can’t go to the gym I can always knit instead. Anyone else think getting up at 0515 to knit is a cunning plan? This entry was posted in Uncategorized on March 26, 2007 by sarahw. I love the double primrose! I must try and track one down. My pretty lilac ones seem to have recovered from last weeks cold anyway. 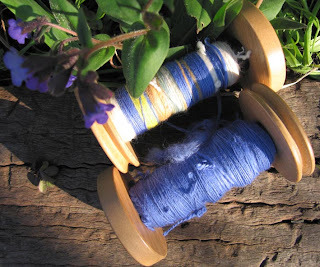 I am in awe of your spinning (and I love the colour!). Sunday certainly was a good day for gardening & today was far to nice to be at work! Sarah, your garden looks interesting, and gives the impression that someone actually cares about it. I really haven’t done much gardening for about three years, and it shows. But I do have two olive trees that have survived my neglect, as well as snow and frost.I like your path; I think it’s rather attractive.